I’m back with the heart symbol as expected. I was deep into it about this time last year too. 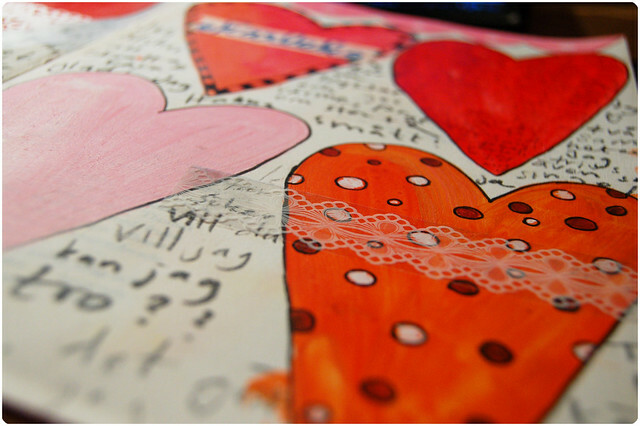 My Art Journal got some sweet lovin’ yesterday, as it the word for the day was just that in Sophie’s and my Diptych Photography Project: Love. How do you photograph love? I’m having such a fun time with this project, surprising myself with my creative take on it. I enjoy playing each day. I enjoy the challenge. I enjoy loading the photos into my computer choosing a favorite. Just one. That is so difficult to me. Even today when the word was sky and the sky was gray rain (and not even a cloud visible, just boring gray) I did manage to take a photo I like! When you request something from yourself you have to oblige, right? And I’m asking my family every night at dinner what they would “do” with the word and then telling them about my idea. I was thinking of how important it is to love yourself when I took my photo #9 yesterday, but now when I look at my self-portrait it looks like it’s me offering love to the world. Both truths I like. Anyway, this post will be my entry for crusade #27: shape up! which is about finding a shape you like and exploring it in your art journal. Play with it, duplicate it, stamp it, carve it, stencil it and so on. Obsession is a good thing according to Michelle Ward. but mostly it’s a thought, an idea I have. I want to create a new art journal, using watercolor papers just as the first Art Journal I made, as I’ve mentioned now a couple of times. 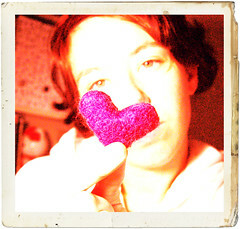 But I’m thinking as the heart month gets closer I will dedicate it to one of my favorite shapes; the (♥) heart, the symbol of love! 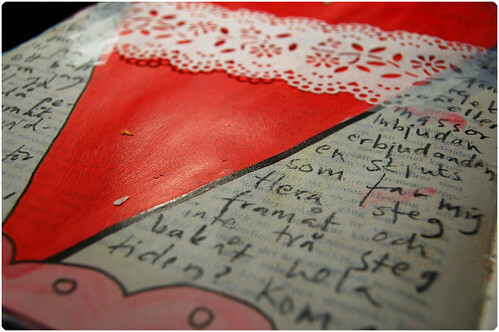 This entry was posted in A Creative Life, Art journaling, Photography and tagged art journal idea, crusade, hearts. Bookmark the permalink. You’re in great shape :) Thanks for the thoughts too…how to photograph love….will ponder this one. Loving all the hearts! And I have to agree, sometimes obsession can be a good thing! something about the shape of hearts i just love! your to funny! ha! great shape, huh? I wish. Thanks for the ♥-felt comments girls! 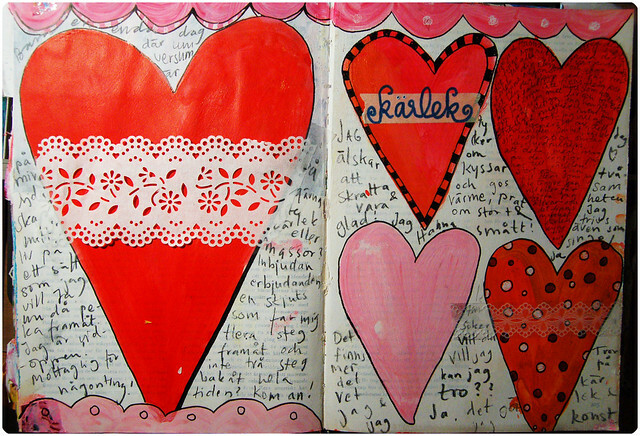 I do heart my art journal. Love the lace, the layering of it on top of the paint is very cool. Great-looking hearts! The lace is a nice touch, too. Love your hearts ! that’s what our world need ! Some lovely heart play Hanna ! Beautiful and red/pink and love-filled ! A perfect balanced obsession, I think ! I love the idea of following your heart made real. Beautiful work! Such a fun and uplifting spread. Great work!